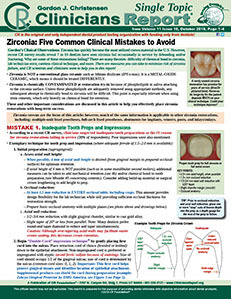 Important considerations to help effectively place zirconia restorations with long-term success. This is one article from the October 2018 issue of Clinicians Report. This is one article from the October 2018 issue of Clinicians Report. For the entire issue, please go to October 2018.